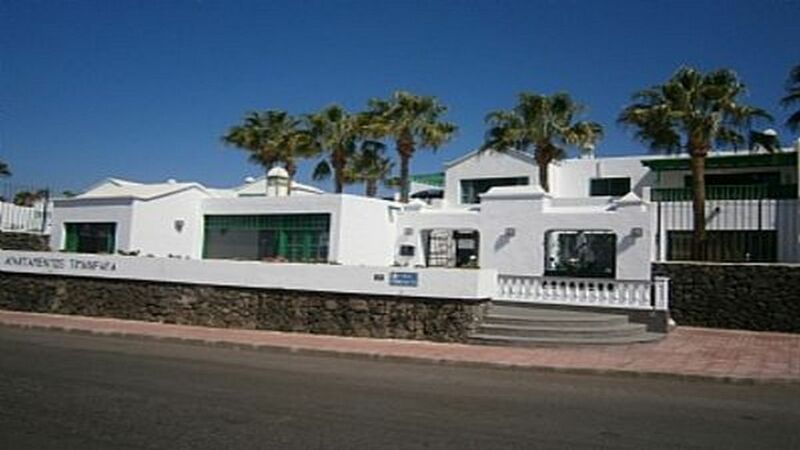 The apartment is located on a quiet, secure and gated complex with heated pool. Situated just 10 minutes taxi ride from the airport and only a short 10 minute walk to the Old Town and Harbour and 5 minutes from the lively nightlife, bars and restaurants on the seafront. The apartment is on the first floor of a 35 apartment low rise complex and has Air Conditioned Bedrooms and its own South facing sun terrace with privacy netting, retractable sun canopy, patio furniture, sunbeds and BBQ. The shared pool is heated for the slightly cooler winter months and has a spacious sun terrace complete with sunbeds and parasols. The apartment boasts a high specification, spacious and fully refurbished tiled bathroom comprising wash basin, large walk-in shower unit, toilet and shaver point. A hair-dryer is also provided. Ideal all year round holiday home for families, young and mature couples No pets. Strictly no smoking inside the apartment. This is a self catering apartment. The combined air conditioning/heating units in both bedrooms are metered. Outside: This spacious and newly refurbished 1st floor apartment with private South facing sun terrace has its own sunbeds, privacy netting, retractable wall mounted sun blind. Patio furniture is also provided for you to enjoy a nice glass of Canarian wine and alfresco dining. Both bedrooms are fitted with air conditioning/heating units. The shared pool is heated for the slightly cooler winter months and is surrounded by sunbathing terraces. The whole complex, comprising just 35 apartments, is secure and fully fenced with a coded gate access. This offers an ideal and relaxing environment for families with young children. There is a reception office (open most mornings) where you can purchase water and arrange taxi transfers. The apartment was clean, spacious and modern with full facilities in the kitchen and bathroom. A welcome pack of essentials was much appreciated supplied by Pauline, the owner, and if you wished to cook there were plenty of oils, herbs and all the necessary equipment. All towels and beach towels were included and the bed linen was as new. The lounge had comfy settees and an entertainment package to want for none, all sky channels plus DVD player. The terrace had newly refurbished sun loungers and chairs which had full sun all day. On the first floor there was hardly any noise unless you count birds and woofers and there was a sea view. Two minutes walk from the sea front restaurants and supermarkets there is precious little to be negative about. The complex has a small heated pool with sun loungers which never became too busy. This will appeal mostly to couples of any age although the majority of long term holidaymakers were of a certain mature variety. Pauline was just the host you would desire and went to great lengths to print our return boarding passes which we later discovered was not necessary but I will take that up with Mr. Thomas Cook. This apartment is worth the wait and when allowed I would love to return. Thank you very much for a very nice review. It was lovely to meet you ,Sue and Violet. I am so glad you all enjoyed the holiday and the weather was so good to. Thank you very much for leaving the apartment spotless .It was a great help to me. I do try and keep the apartment up to high standards as that is what brings my customers back time and again. Any time you feel like a get away please feel free to contact me anytime. Hope you got home safe and sound . Brilliantly located 2 bedroomed apartment, the best balcony ever! So glad you enjoyed your stay and it was lovely to see you all again. Thanks for leaving the place nice and tidy. Mail me anytime you need a break . Apartment in a good location and with everything you would need for a relaxing holiday. Pauline helpful and really nice. Thankyou very much for your review. Lovely to have met you both. I am glad you enjoyed your stay and please feel free to contact me anytime you would like to return. Thanks for leaving the apartment so nice and clean. Much appreciated . Many thanks for your review. Lovely to meet you and the family. Thanks for leaving the apartment so nice and clean. Hope you flight was better going home as you had so many cancelled before your arrival. Glad you enjoyed the break and hope to see you again soon . We have been staying in this apartment for about 5 years and we stayed for a month in Sept/Oct 18. The apartment is in the perfect location, just far enough away from both the strip and old town but very easy walking distance. The apartment is great value for money and Pauline could not be more helpful. Unfortunately for us the secret is out and she is already booked up for the same time next year but we will be back at some point. It was lovely to see you both again and I am glad you enjoyed your stay. Many thanks for leaving the apartment so nice and clean as usual. I do have you both booked in for 2020 as its so busy now. Please feel free to contact me at any time for any more information you may need. Excellent apartment in a small quiet complex. Hi Alison many thanks for your review. So glad you had a lovely time and the weather was fab as well. It is always nice to meet new people and hear there comments. I do try and keep it up to date and make it home from home. Look forward to seeing you in the future ..